Lexington, KY – August 17, 2012 – The lights were bright in the Rolex Stadium as the onlookers cheered on their favorite horse and rider combinations in a highly competitive 14-horse jump off. It was the $25,000 Hagyard Lexington Classic that took center stage tonight, seeing a field of 50 entrants vie for the top prize and valuable series points. Shane Sweetnam and Amaretto D’Arco jumped to the fastest of only four double-clear efforts, leading the night’s victory gallop. Kaitlin Campbell was just a hair shy of Sweetnam’s time, finishing in the second place spot with Rocky W.
Tonight’s class was the fifth of seven grand prix events that make up the Hagyard Challenge Series, sponsored by Hagyard Medical Institute and presented by Pfizer Animal Health. 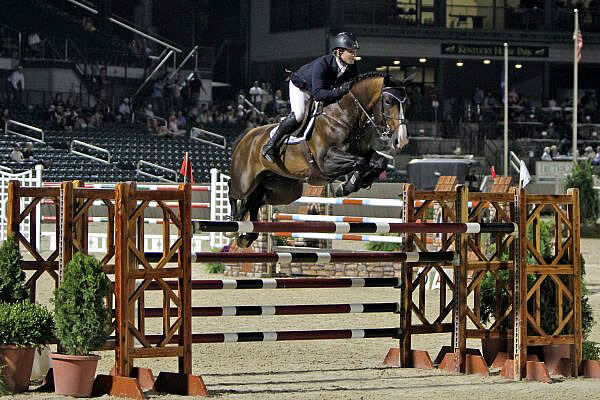 The rider accumulating the most points throughout the series will be presented with the bonus during the $50,000 World Cup Qualifier at the Kentucky National Horse Show in September 2012. Allen Rheinheimer designed the track tonight, utilizing standalone verticals, rollbacks, technical lines, an oxer-oxer double combination, a vertical-oxer double combination, and a tight oxer-vertical combination leading into a daunting oxer. Riders had to navigate the course within the tight time allowed of 95 seconds, treading carefully with the agility to leave all the rails in their cups. The short track became the true adversary tonight, with 14 riders competing over seven obstacles in an attempt to take the winning title. The course began over a natural oxer and then demanded a left turn over a new vertical; from there riders had to make a sharp right turn and take the oxer-vertical double combination and then make a hard left rollback to the Hagyard vertical. Pace became crucial when heading toward the “L” shaped gate where riders took the vertical and then made a right rollback over a second vertical, finally progressing forward to break the beam after landing from the final oxer near the in gate. Rebecca Conway and Twister, owned by Blue Hill Farm, were the first to post a faultless second round. Conway had seen three other riders find fault, and took a more conservative approach as the fourth in the return order. She piloted Twister to a time of 46.529 seconds, eventually claiming the fourth place honors. It was Rachel Udelson and VDL Wardolette who set the pace for the remainder of the contenders. Udelson rode VDL Wardolette to a brilliant round, making a fantastic turn to the vertical and galloping to a finish in 41.316 seconds. Her reign was short lived, however, as Kaitlin Campbell and Rocky W followed with a faultless round in 40.235 seconds. It seemed as though Campbell would take the lead for the second consecutive event, but Shane Sweetnam and Amaretto D’Arco were prepared to give it their all for the victory. Sweetnam moved veteran mount Amaretto D’Arco over the opening oxer at an angle, catching a speedy pace into the following vertical. Similar to that of Campbell, he sliced the turn to the Hagyard vertical and used his mount’s natural speed on the ground to his advantage. Sweetnam crossed the finish line in 39.947 seconds, only two-tenths of a second faster than Campbell to take the lead. Udelson took the third place award for her efforts aboard VDL Wardolette, with Conway taking the fourth place. David Biesel and Ammeretto, owned by Equine Holdings, earned the fifth with two time faults factoring into their finish. Andrew Welles and XM, owned by Peter Welles, rode to the sixth place finish with the fastest four-fault effort in 40.596 seconds, lowering the final oxer as he tripped the timers. In addition to competing for the winning title tonight, riders had the opportunity to win $2,000 in bonus money as a part of the SSG Riding Gloves ‘Go Clean for the Green’ promotion-riders wearing the SSG ‘Digital’ Riding Gloves with the SSG horse head logo clearly visible during all rounds of competition in designated events are eligible for the bonus. Tonight Sweetnam was wearing a pair of the SSG ‘Digital’ Riding Gloves, and collected the bonus. He admitted that the gloves may have had some play in the way the results panned out. Riders will have the opportunity to compete for the highly desired bonus money this Sunday during the $40,000 Bluegrass Festival Grand Prix. Sweetnam will also be a contender, and someone who will wear a target on his back for his recent victories during the Kentucky Summer Series. Tomorrow, the exciting line-up of events will continue at the Bluegrass Festival Horse Show. The Final Round of the $100,000 USHJA International Hunter Derby Finals will get underway at 8 p.m. in the Rolex Stadium, with the Consolation Round taking place at 4 p.m. On Sunday, the competition will come to a close after riders compete in the $40,000 Bluegrass Festival Grand Prix.